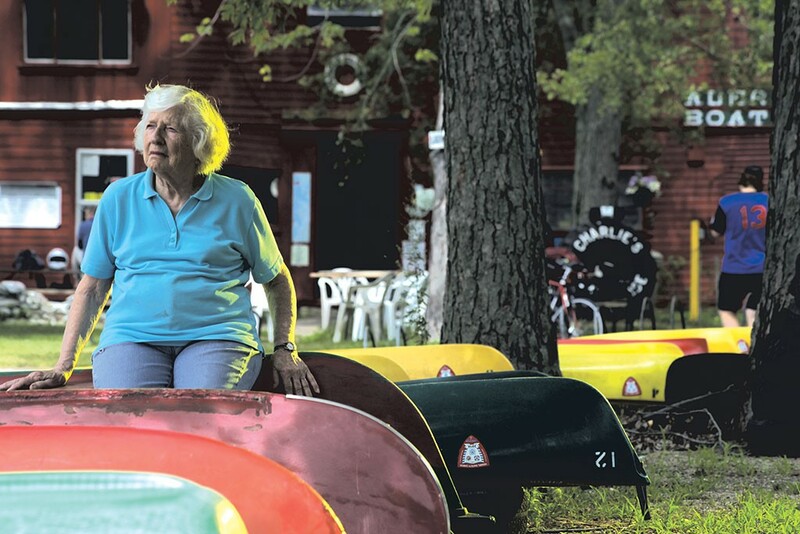 Defying nature and economics, two octogenarian siblings run Charlie's Boathouse — a whimsical outpost at the confluence of the Winooski River and Lake Champlain. The shop, which has offered boat rentals, bait and food since their father built it in 1928, has a cult following among locals and out-of-towners. But the business' future is uncertain, and some of its most loyal customers are trying to help Charlie Auer Jr. and Christine Auer Hebert ensure that their family legacy lives on. "It's an institution," said Frank Romary, a New North End resident who's frequented it for years. "It is probably one of the most unique places in all of Vermont," said Brian Costello, cofounder of Local Motion. "We've got to pull together as a community and help them." A community-wide effort has yet to coalesce, but a retired minister-turned-cartoonist is trying to create momentum by recruiting local artists, who are selling paintings to benefit the boathouse. 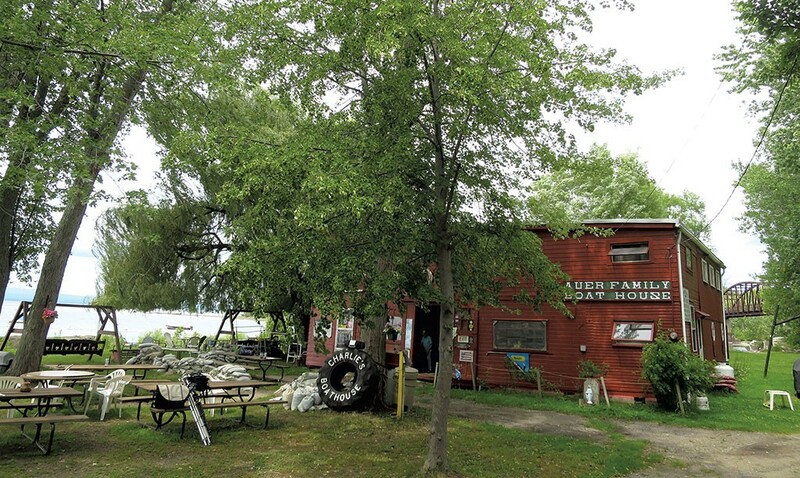 The Burlington Bike Path, which passes by the out-of-the-way establishment, is how most people discover Charlie's, also known as the Auer Family Boathouse. A hand-painted sign nailed to a tree advertises "Candy to Soda" with arrows pointing down a bank toward the lakeside boathouse. Charlie's is accessible by car, too, but only if you drive north on North Avenue until it turns to gravel and dead-ends at the low-lying "Mouth of the River" community that has grown up around it. Back in the day, residents of this swampy section of Burlington were less-than-affectionately referred to as "river rats." Costello got to know the Auer siblings because they let Local Motion use their land to launch a ferry across the Winooski River before the bike path bridge was built. With obvious fondness, Costello describes the place as "frozen in time": The drooping willows, the marshy mouth of the Winooski and a laid-back vibe give it a vaguely southern feel. It's almost certainly the least pretentious and most welcoming lakeside establishment in town. Eclectic lawn furniture offers varied lounging options around the three-acre property. Pots of fake lilies adorn the trees. Kayaks and canoes are stacked sardine-style on the grass; red-and-green rowboats are beached near a silver bunker-like building. A simple wooden dock extends into the lake. On the grass nearby are several unoccupied parked campers as well as a historic streetcar that a Monkton couple has converted into a summer home. The lacquered red boathouse building has the musty aged-wood smell of an old barn. 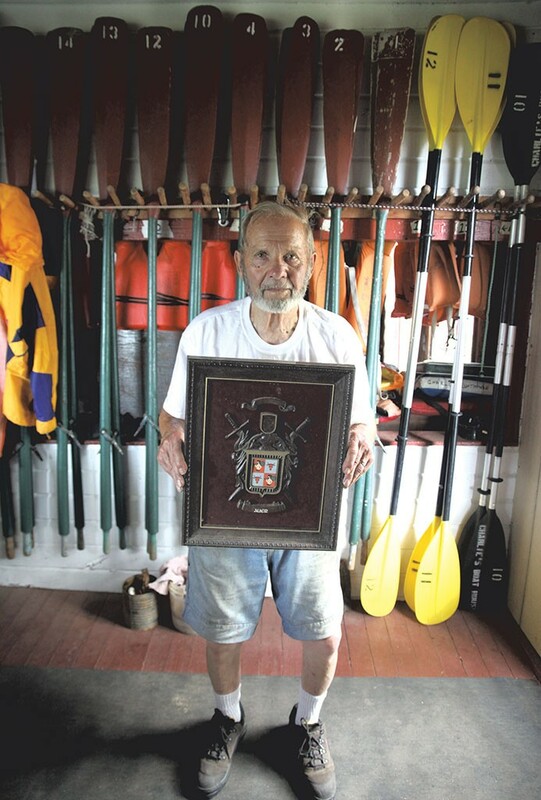 Wooden oars handcrafted by Charlie Sr. and ancient orange life jackets — stuffed with cork for buoyancy — line the walls. In the rafters are bamboo fishing rods, fork-like spears for gigging frogs and bait buckets. Behind a glass counter displaying candy — including butterscotches for three cents and $1 chocolate bars — one sibling or the other stands ready to serve up a cold beverage or a cheeseburger, known here as a Charlieburger. Christine, 89, has curly white hair, lively blue eyes and an impish smile. Her younger brother Charlie is 85, with a chin-curtain beard and a booming laugh. They are uncannily energetic and overflowing with boathouse lore. "They both have the gift of gab," said Pat Lovejoy, a Colchester retiree who's been coming to Charlie's Boathouse since he was boy. He lingered there after a lake swim last Thursday afternoon, chatting with Charlie and recalling childhood fishing expeditions. The Auer siblings grew up spending their summers at the boathouse, and they've run it together since their mother died in the early '90s. (Their older sister and brother have since passed away.) 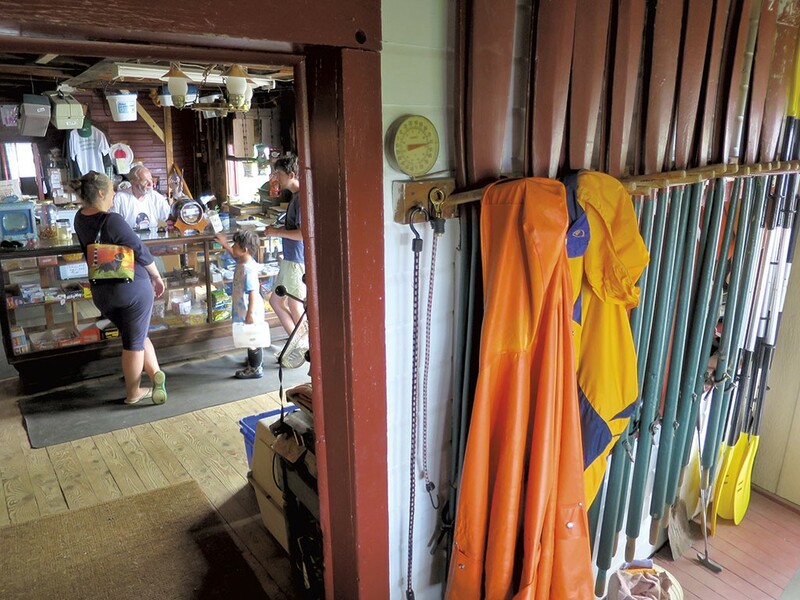 When it comes to maintenance, Christine presides over the boathouse — clambering up a ladder to apply a fresh red coat to the exterior every three years — while Charlie tends the grounds. He also handles the boat rentals. With the lake level so low this year, he's been wading way out into the lake to help customers launch in deeper water. Officially, neither sibling lives at the boathouse. But from the moment the place opens in May to its closure at the end of September, one or the other is always there — 24 hours a day, according to Christine. There have been at least half a dozen break-ins over the years. They alternate days behind the counter, which is open from 10 a.m. to 8 p.m.; on Sundays, each takes a shift so the other can attend mass. Charlie was on boathouse duty last Thursday, and Christine and her husband showed up midday with a carload of groceries. The three of them began unloading cases of Coke and packs of Klondike bars. Without being asked, four customers began helping, including a pair of middle-school-age boys from Milton. Afterward, as Charlie rang up the boys' candy purchase, he made them do the arithmetic to figure out how much change they should get. "Thank you for coming down," he called to them on their way out. "It's our pleasure. We like it down here," responded one. "See ya later, Charlie!" shouted the other. The boathouse isn't very profitable — which is almost a point of pride for its owners. "It's not like a business," Christine explained. She and her brother separately related the same memory of their mother serving meals to indigent boathouse visitors without charging them. "On Fridays, it was strictly fish chowder," Charlie recalled. That charitable ethos has stuck with the siblings, who actively encourage people to loiter at their lakeside establishment whether or not they've purchased anything. As the only snack shop along the bike path between downtown Burlington and South Hero, Auer's could probably get away with inflated prices. Instead, they're uncommonly low. Charlie and Christine rely on a cash register that can't ring up items that exceed $5 — the price of a Charlieburger. Putting people above profit is a large part of what endears Charlie's Boathouse to its customers. But that approach also accounts for its tenuous existence. "The taxes are so high, all we're doing is holding the ground," Christine acknowledged. According to the city's database, their tax bill is about $11,000 for a property valued at $400,600. The seasonal establishment has only a few months to make enough money to pay the bills. Friends and customers — the lines blur at the boathouse — say that when expenses exceed revenue, the siblings use their retirement money to keep it going. The boathouse's location is also precarious. Stacks of white sandbags surround the building, providing a makeshift barrier between it and the water. Over time, according to Charlie, the encroaching lake has claimed three of the original six acres. In 2011, a spring flood destroyed furniture and inventory. "They almost lost that whole place," said Costello. "They survived with the help of their army of friends," he noted. Despite the setback, the duo shows no signs of slowing down. "My mom ran it 'til she was 98," Christine pointed out. "Let's just say, I'm hanging in there." Customers marvel at their joie de vivre but can't help but wonder what will ultimately happen to the place. "Charlie and Christine will run it as long as they can," Costello said. "After that, the future is uncertain." Christine and Charlie are more apt to talk about the past than the future, and they haven't figured out a plan for the latter. Charlie has four children and Christine has three, but none of the third-generation Auers are angling to take over the family business. "They don't have an interest because it's 24 hours a day, seven days a week. And there's no pay," Christine said matter-of-factly. To get paid, "We'd have to raise prices," noted Charlie, his tone indicating that this point was not up for negotiation. Customers are brainstorming other ways to help keep the boathouse viable. Jim Gorman, a retired minister-turned-cartoonist, went to Charlie's as a boy. His father was in the Army National Guard with Charlie Jr., who served for 40 years. After a decades-long absence, Gorman stopped by on a whim while biking; for the last 15 years or so, he's been a regular. "There's going to be a point when they can't keep doing it," he said of Charlie and Christine. A quick flip through the boathouse guestbook reveals an international clientele from countries including Germany and Denmark. Yet the owners themselves observe that locals have been less inclined to patronize the place. In an effort to gin up support for what he considers a "local treasure," Gorman has been recruiting artists to paint at Charlie's. It's rekindling a tradition that dates to the early 20th century, when people used to lug easels to the boathouse to paint the expansive lake view or the river mouth. Last Friday, a group of about 10 artists sold their boathouse paintings, which ranged from $25 to at least $300, at Vermont Art Supply on Pine Street to raise money for the boathouse. They collected more than $600 and are planning a second sale. Gorman hopes this project could lead to something larger. "My goal is to make this a place for painters to come," he said. "Who knows? It may be the beginning of an artist colony." Mary Krause, an artist from Essex, heard about Gorman's idea from a fellow painter. Last Thursday at Charlie's, she worked intently on a lake scene, refining the hues on three rowboats in an oil painting she had begun on a previous visit. "I fell in love with the place," she said. "It's just an artist's dream." But art alone won't keep the boathouse afloat. Multiple customers expressed the same concern: that condos or a private marina might someday replace the people's paradise. Costello, who's worked with local land trusts, suggested the property has potential, but he noted that conservation efforts hinge on "community support." Meantime, he advised developers not to "waste breath" trying to court the Auer siblings. "They don't have plans to cash out to the highest bidder," he asserted. Christine did note that she and Charlie nearly accepted an offer to sell, but they changed their minds when the buyer tried to renege on a condition. "The agreement was, we would sell, but we would stay here until we were ready to go," Christine explained. "You can't shove me out to pasture. What would I do if I was sitting at home?" 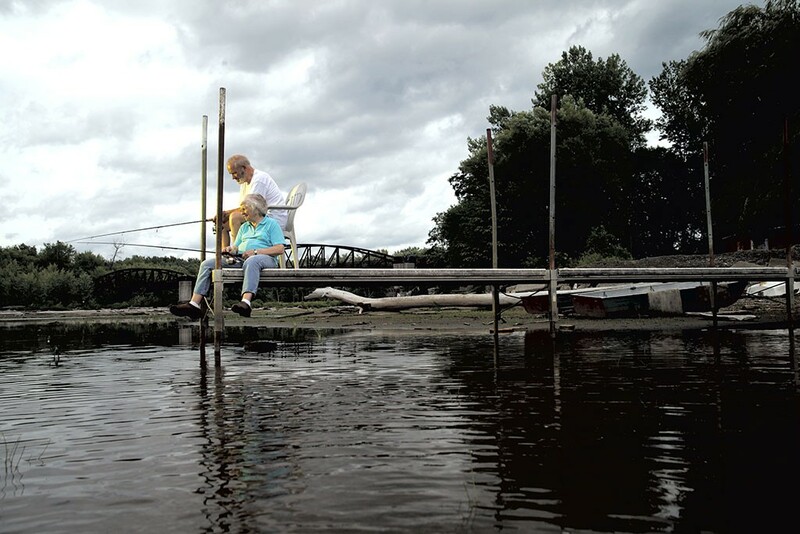 Her hope is to preserve Charlie's Boathouse as a place anyone can pop into. "Even if it wasn't a business," she suggested, "I would love it as a park."